In its effort to prevent miscreants from abusing the platform to impede into users’ privacy or spread negative content, WhatsApp now lets users block or report any user they find questionable. Individual chat users can report a contact without blocking/deleting messages or they can report and block the contact and delete the chat messages. 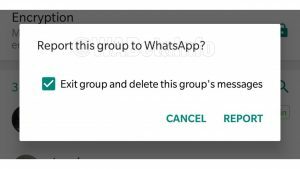 In group chats, users get a choice to report and exit the group and delete messages. Otherwise, they can simply report the group to WhatsApp without leaving the Group. This is present only in the beta version. For now, individual chat users can report and block a contact, and this will delete the chat messages. In group chats, users can report a questionable user and exit the group. Noticeably, it is not merely a report button in the non-beta version, rather it is ‘report spam’. WhatsApp faced scrutiny when incidents of mob-lynchings based on rumours spreading through WhatsApp were reported in countries like India and Bangladesh.